Come join our amazing team of Pediatric Registered Nurses supporting individuals with brain and spinal cord injuries and other catastrophic injuries and illnesses. Make a difference every day as a patient advocate providing prescribed nursing services, training and supports to address the medical and psychiatric needs of individuals with Acquired Brain Injury and other catastrophic injuries. 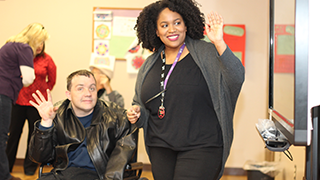 We provide a balance of service and support – combining personal choice, flexibility and community integration with professional oversight, family involvement and stability. CareMeridian is a partner of The MENTOR Network. Founded in 1980, The MENTOR Network is a national network of local human service providers offering quality, community-based services. With approximately 30,000 employees serving 30,000 individuals in 36 states, you'll have career opportunities from coast to coast. When you join The MENTOR Network, you’ll make a difference every day and help to provide quality of life enhancing services to individuals across the country.